Atop Florence's cobblestone streets, a man's paintbrush mimics the lines of the distant Ponte Vecchio, creating a soft yet detailed version of the Arno beneath it, the colored houses, the silhouette of mountains. This is the process of Hudson-born artist Michael Patterson. Since childhood, he has been driven to create art, heavily influenced by his grandfather Howard Ashman Patterson, whose paintings lined the walls of his home. His acrylic, oil, and watercolor works are figurative and abstract displays of nature's lyricism, capturing light and movement. In translating the act of people watching into painting, Dappled Street is part of a series where Patterson studied clusters of people walking in the East Village. He visually depicts changing colors and light patterns. "There's something poetic about the way light travels through space, and falls on the ground and people," says Patterson. The artist's career has taken him from the Hudson River to French beaches. "I painted every Hudson River sunset," Patterson recalls with nostalgia, which he viewed from his window growing up. In his 30s, Patterson moved to Europe, where he lived in Paris for three-and-a-half years, traveling to places like Greece, Spain, Italy, and Ireland. On the Western coast of France he crafted thousands of drawings while watching people sunbathe, children play, and light wrap around the earth's surface. Rather than drawing from a static photograph, he revels in the ever-changing nature of people and land while admiring nature's geometry. During our conversation, he examined a dandelion seed while explaining, "God declares his touch through nature, so he's speaking to us all day long." The portability of watercolors aided his travels, making it possible to paint many places while in transit. Full-sized oil paintings like Dappled Street are made in his studio, inspired by the original, smaller watercolors created en plein air. In addition to painting, he produces stone carvings out of marble and granite, intrigued by the luscious look of the rocks and the permanence of altering stone. After his European adventures, Patterson lived in Croton-on-Hudson and Roxbury, Connecticut, where he currently resides with his wife. Through drawing inspiration from Picasso to Giotto, Patterson takes organic settings and interprets their beauty and movement through an abstract lens. In his work, we see light dancing, feel people move around us, and experience what our daily lives do not normally allow—to stop and enjoy. Patterson's work will be featured in a number of shows this summer, including the Amagansett New York Fine Arts Festival, July 4-6. 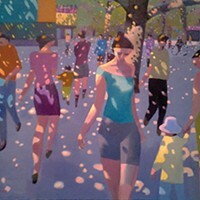 Visit his website for upcoming exhibitions and to view more art: Pattersongalleries.com.